A flower is composed of four distinct whorls, viz. calyx, corolla, andreocium and gynoecium. Calyx: This is the outermost whorl and is composed of green leaf-like structures called sepals. Sepals protect the flower during bud stage. Corolla: This is the second whorl of flower and is composed of colorful petals. Petals are generally large and showy, and attract animals for pollination. Androecium: This is the third whorl of flower and it represents the male reproductive structure of flower. Androecium is composed of stamens which are male reproductive organs. Gynoecium: This is the fourth and central whorl of flower, and represents the female reproductive structure of flower. A stamen is composed of two parts. The long and slender part is called the filament. The terminal structure at the top of the stamen is called anther. The anther is generally bilobed, i.e. has two lobes. The proximal end of the filament is attached to the thalamus or the petal of the flower. Number and length of stamen vary in different species. Structure of Anther: A typical angiosperm anther is bilobed. Each lobe has two theca, i.e. each lobe is dithecous. A longitudinal groove runs lengthwise to separate the theca. The two lobes of an anther are quite distinct in transverse section. An anther is a tetragonal structure consisting of four microsporangia located at the corners. Two microsporangia are located in each lobe of the anther. The microsporangia undergo development and become pollen sacs. They extend longitudinally through the length of an anther and are packed with pollen grains. 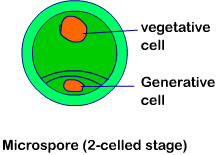 Structure of Microsporangium: A typical microsporangium appears nearly circular in outline. It is generally surrounded by four wall layers, viz. epidermis, endothecium, middle layers and tapetum. Tapetum is the innermost wall layer. Tapetum nourishes the developing pollen grains. Cells of the tapetum have dense cytoplasm and are generally bi-nucleate. In young anther, a group of compactly arranged homogenous cells occupies the centre of each microsporangium. This group of cells is called sporogenous tissue. Microsporogenesis: As the anther develops, the cells of the sporogenous tissue undergo meiosis to form microspore tetrads. Each cell of the sporogenous tissue is capable of giving rise to a microspore tetrad and hence each such cell is a potential pollen mother cell (PMC) or microspore mother cell. The process of formation of microspores from a pollen mother cell through meiosis is called micrsporogensis. When microspores are formed, they are arranged in a cluster of four cells. This cluster of four cells is called microspore tetrad. When the anthers mature and dehydrate, the microspores dissociate from each other and subsequently develop into pollen grains. Pollen grain: The pollen grains represent the male gametophyte. Pollen grains are generally spherical, but can show great variations in shape and appearance. A pollen grain measures about 25 – 50 micrometers in diameter. It is covered with two-layered wall, viz. exine and intine. Exine: The outer layer is hard and is called exine. Exine is made up of sporopollenin. Sporopollenin is the most resistant organic material known. It can withstand high temperatures and strong acids and alkalis. Till date, no enzyme is known which can degrade sporopollenin. There are prominent apertures on the exine. These apertures are called germ pores. Sporopollenin is absent at germ pores. Because of the presence of sporopollenin, pollen grains are well preserved as fossils. Intine: The inner wall of the pollen grain is called intine. This layer is thin and continuous layer. It is made up of cellulose and pectin. The cytoplasm of pollen grain is surrounded by a plasma membrane. A mature pollen grain contains two cells, viz. the vegetative cell and generative cell. Vegetative Cell: The vegetative cell of pollen grain is bigger, has abundant food reserve and a large irregularly shaped nucleus. Generative Cell: The generative cell of pollen grain is small and floats in the cytoplasm of the vegetative cell. It is spindle shaped with dense cytoplasm and a nucleus. In over 60% of angiosperms, pollen grains are shed at this 2-celled staged. In remaining species, the pollen grain generative cell divided mitotically to give rise to the two male gametes. Thus, pollen grains in these species are shed at 3-celled stage. Viability of Pollen Grains: The viability period of pollen grains is highly variable and to some extent depends on the prevailing temperature and humidity. In some cereals; such as rice and wheat; pollen grains lose viability within 30 minutes of their release. In some members of Rosaceae, Leguminoseae and Solanaceae; pollen grains maintain viability for months. It is possible to store pollen grains of a large number of species for years in liquid nitrogen ( - 196° C).